Empowerment: Screen grabs of some of the winning entries—from advice on cancer to medical training. This was the first year that the awards, now in their fifth year, were extended to seven South Asian countries. For a complete list of the Manthan awards, which were also supported by Mint and the government of India’s Centre for e-Governance this year, visit manthanaward.org. Every morning, Sumana Sumuk walks into a room in Bangalore to teach mathematics to 420 children, none of whom are actually in the room. They’re in 14 schools across rural Karnataka, beamed into Sumuk’s classroom daily via satellite for 60 minutes, so that she can show them that math doesn’t have to be difficult, and that it’s no reason to leave school. Two years ago, when Nandini Mundkur participated in a survey of Karnataka schools, she discovered that the dropout rate in rural areas was abnormally high: between 40% and 50%. When she mentioned her concerns at a dinner, she was taken aback when someone offered the satellite time. It was to be the start of a programme titled: Learning is Fun. Mundkur emphasizes that Sumuk’s lessons complement the school curriculum. “We want to make the learning process enjoyable, so that the kids aren’t daunted by the subject," she says. Sumuk recently conducted a World Cup of Book Cricket for her wards. Sumuk’s classroom consists of a video camera and a large screen with a view of one of her 14 classrooms. There is a “hand-raise" facility, so she can switch to that particular classroom. “Just to start my day looking at these kids, all eager to learn something, is completely?worth it," says Sumuk. On a television screen at the MEdRC stall at the Manthan conclave, a man is intently studying a bone, a femur, judging by its appearance. He rotates it meditatively this way and that, and then he turns to a detailed, three-dimensional schematic of the bone on his computer. That schematic is one minuscule element of MEdRC’s hugely ambitious project—to digitise and virtually deliver the theory component of the entire Indian undergraduate medical curriculum. “We found that medical lecturers spend 70% of their time just delivering the same didactic facts over and over," says Neeraj Raj. “By digitising these lectures, we can reverse the figures; students can now use that same 70% of their time to practise their skills." The digitised curriculum consists of detailed lectures by nationally known teachers, captured in video and accompanied by bright graphic models to illustrate the theory. “The advantage is that students can rewind these lectures, or return to them at any time to revise their studies," says Dr Raj, the director of MEdRC. A pilot programme, at the NTR University of Health Sciences in Andhra Pradesh, is already under way. The next step, however, is dauntingly large. By tying up with partners such as Cisco, Microsoft, Intel and BSNL, MEdRC wants to build Rs3 crore worth of infrastructure in every Indian medical college, a precursor to a broader delivery of its digital content. “Per student, the cost of this will work out to Rs2 lakh, which is not significantly more than the total cost of a medical education," says Dr Raj. “We want to deliver this content end-to-end: from our servers, on the BSNL backbone, to laptops provided by us to every student." In Chhattisgarh’s Naxal-affected Dantewada district, a truck carrying rice to a government rations shop in Bijapur was being diverted to a mill in neighbouring Bidam. In minutes, an anonymous call to a Raipur call centre, run by the state government’s department of food, civil supplies and consumer protection, helped the local administration seize the truck. The miller and the godown owner, who allegedly colluded to steal the rice, were also arrested. In November 2007, a Unified Ration Card Project (URCP) was launched in Chhattisgarh, with an online database of beneficiaries and ration shops. It also included a grievance redressal system for registering complaints online or through a toll-free number. In one year, 1,700 complaints have been been handled here. The tools for information dissemination and punitive action have been simple: the Internet and the call centre, run by some 1,000 operators in Raipur. “In Chhattisgarh, no one needs to apply for a ration card. As per the state database of people below the poverty line, ration cards are delivered at doorsteps and a record of beneficiaries is maintained,’’ says A. K. Somasekhar, project leader. Applying for or renewing ration cards involves furnishing minute details, to be cross-checked by the government. To check irregularities, the call centre directs complaints to collectorates across the state for action and enquiry. “Since the service is toll free, anyone—from ration shopowners to families who haven’t received their quota of grain —can inform the government about irregularities," Somasekhar says. A part of the project is also dhaan kharidi, or rice sale. Six government agencies and village cooperatives, along with the National Informatics Centre, have collaborated to procure rice from farmers faster. Millers can register for or renew licences for their rice mills online and upload details on paddy sales and godowns in the state’s 16 districts, from where it is distributed to ration shops. Payment requests are made online, and cheques are delivered within hours. In 2006, when Ritu Joseph Biyani drove around India for six months, she’d attract attention at every village where she stopped. “People would first be astonished that a woman was driving," she says. “Then they’d be astonished that I was there to talk about cancer. And then even more astonished that I was there to talk about breast cancer." That 30,200-km trip, named Project HighWays, was Biyani’s response to her own battle with breast cancer, which started in 2000. Biyani, an army captain and a dental surgeon, had enjoyed the robust life before her illness—paratrooping, skydiving, and cross-country drives—and she looked to the robust life after her illness, when she set out to spread the word. So Biyani bundled her 14-year-old daughter and another volunteer into a Ford Endeavour and began driving across India, stopping only to deliver extensive presentations on cancer. “There was the language barrier, so I made visually strong PowerPoint presentations, with animations and charts and patient photos," she says. In some places, where she could get a projector, she spoke to as many as 400 people at a time. Biyani’s two-hour presentation included practical matters such as self-examination for lumps, but it also had to bust many myths. “Some people thought cancer was infectious, and wondered why I was out like this," she says. “And I’d always get the question: ‘Why are you bald?’"
Biyani has done only shorter drives since that mammoth one, but she has rapidly become an ambassador for cancer. “I give out my number freely, and I get calls from everywhere. People call me for even an hour at a time, to talk about cancer," she says. And then she insists, more than once, that Mint publish her mobile number. “I’m happy to talk to anybody who calls." Call her at +91 9881232744. Towards the beginning of 2003, mobile ladies on bicycles began touring six villages of Bangladesh. They roamed from door to door with a mobile handset, offering help for livelihood problems in the villages. This was part of non-governmental organization Development Research Network (D.Net)’s ambitious Jeeon-IKB Information for Life project. It began with six women and four rural information centres connected to a helpdesk in Dhaka, which received and responded to queries from the villagers. “The response was overwhelming. We also realized we didn’t have enough data to answer such a range of problems,’’ says Masum Billah, deputy director. So, an exhaustive digital database on a range of livelihood issues—from cattle rearing to disease prevention, and solutions was created online in 2005 with help from experts. Jomila, 55, was one of the first villagers to seek medical help for her abdominal pain from one of the mobile ladies. After having spent hundreds of takas (Bangladeshi rupee) on local doctors, she was taken to a rural information centre for help. A few calls to the helpdesk helped her find the right medicine. “We also found that 40% of our users are women, who mostly called with health-related problems. So, we developed women-friendly content and also employed two doctors at the helpdesk,’’ says Billah. 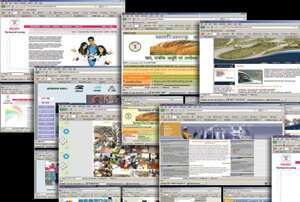 Five years on, the Jeeon database, with 25,000 online pages and 106 telecentres to receive and respond to queries, has helped 75,128 villagers find solutions to their livelihood issues. Another 30,000 have benefited from its ancillary services and training programmes. Jeebika, the project’s job portal for rural youth, is now connecting the unemployed to job opportunities. The “mobile lady", so far the human centric access point to information for villagers, has also become quite popular. After nearly two years of painstaking translation of at least 3,000 English computer terms into Pashto, the first feedback Rafiqullah Kakar received was a 300-page report, listing all the bugs in his software. “We tested it extensively for two months, since it takes very little for people to get annoyed and never use our software again," says Kakar, the country Team Leader of the Afghanistan Computer Science Association, under that country’s ministry of Communication and Information Technology. Pashto speakers account for around 40% of Afghanistan’s population, and localization converting computer software into local languages—is a complicated and nuanced task, designed to simplify the often convoluted language of computers. “It’s a slow and painful learning process—figuring out what is ‘File’ or ‘Edit’ or ‘Print Preview’," Kakar says. His team of 11 people have, so far, translated and localised Windows XP and Microsoft Office, the free and open-source browser SeaMonkey (which doubles as an email client), and created Pashto fonts, penned by an expert calligrapher. Kakar recalls the excitement when he held an exhibition. “We showed people how this worked, and they were so amazed to see their handwritten text appear on the computer. We had long queues to buy our CD!" Kakar now wants to take this two steps forward—encouraging the use of free and open-source software. Ubuntu, a variant of the free operating system Linux, and Open Office, an alternative to the Microsoft Office suite, are up next for localization. “A genuine copy of Windows costs nearly $300,and that’s higher than our Gross Domestic Product per capita," Kakar says.